Mouse anti Human chorionic gonadotrophin antibody, clone INN-hCG-22 (MCA329) used for the detection of human choriogonadotrophin expressing cells in urothelium by immunofluorescence. 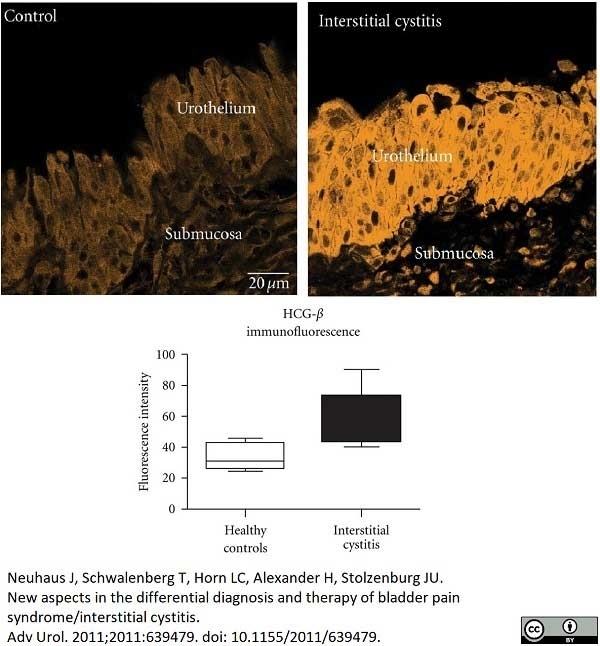 HCG-beta (beta-2 epitope) immunoreactivity in urothelium. (a) Control bladder from a 36-year-old woman, gynecologic tumor, no bladder carcinoma; (c) BPS/IC bladder of a 53-year-old woman showing extreme upregulation of HCG-beta; bar in (a) applies to (a and b); (c) Quantitative analysis revealed significant differences between female controls () and female BPS/IC () patients (Mann-Whitney test, ). From: Neuhaus J, Schwalenberg T, Horn LC, Alexander H, Stolzenburg JU. New aspects in the differential diagnosis and therapy of bladder pain syndrome/interstitial cystitis. Mouse anti Human chorionic gonadotrophin antibody, clone INN-hCG-22 recognizes the beta subunit of human choriogonadotrophin (hCG), also known as chorionic gonadotrophin. hCGβ is a 165 amino acid ~18 kDa hormone involved in the stimulation of steroid production essential to the maintenance of pregnancy. 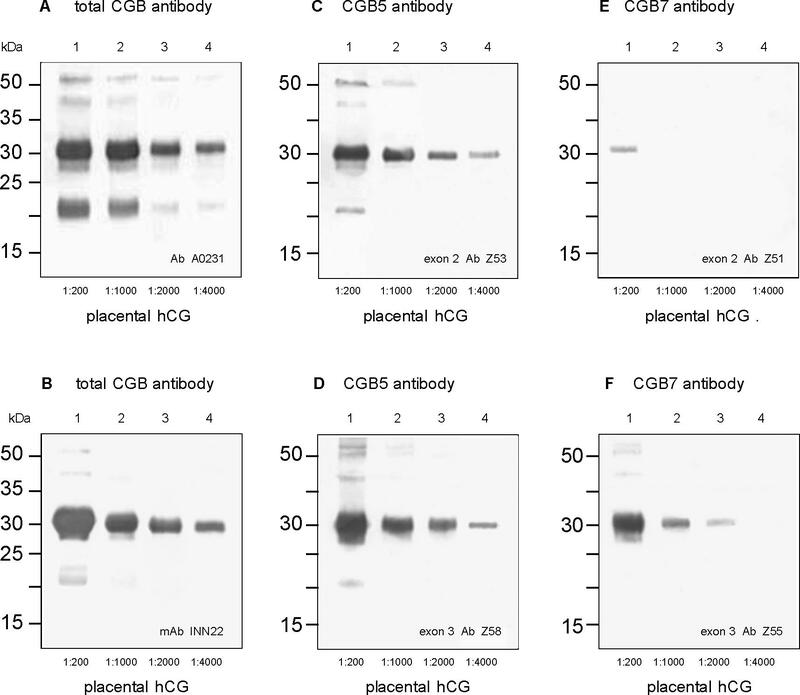 Mouse anti Human chorionic gonadotrophin antibody, clone INN-hCG-22 shows a strong reaction in RIA with intact hCG and hCGβ and some reactivity with human luteinizing hormone (12%) and b-hLH (34%). No reaction with human follicle-stimulating hormone, thyroid-stimulating hormone , a-hCG or a-hLH. Affinity constant = 1.6 x 109m (Ka) . Spleen cells from an immunised BALB/c mouse were fused with cells of the mouse myeloma cell line P3 - NS1/1 - Ag 4.1. Kofler, R. et al. (1982) Monoclonal antibodies against human chorionic gonadotropin (hCG): I. production, specificity, and intramolecular binding sites. Am J Reprod Immunol. 2 (4): 212-6. Zimmermann, G. et al. (2009) Epithelial human chorionic gonadotropin is expressed and produced in human secretory endometrium during the normal menstrual cycle. Yoshie, M. et al. (2010) Possible role of the exchange protein directly activated by cyclic AMP (Epac) in the cyclic AMP-dependent functional differentiation and syncytialization of human placental BeWo cells. Hum Reprod. 25 (9): 2229-38. Zimmermann, G. et al. (2003) Expression of beta hCG and alpha CG mRNA and hCG hormone in human decidual tissue in patients during tubal pregnancy. Mol Hum Reprod. 9: 81-9. Charrel-Dennis, M. et al. (2005) The human chorionic gonadotropin-beta arginine68 to glutamic acid substitution fixes the conformation of the C-terminal peptide. Zimmermann, G. et al. (2012) Expression and production of human chorionic gonadotropin (hCG) in the normal secretory endometrium: evidence of CGB7 and/or CGB6 beta hCG subunit gene expression. Biol Reprod. 86 (3): 87. Neuhaus, J. et al. (2011) New aspects in the differential diagnosis and therapy of bladder pain syndrome/interstitial cystitis. Assay Drug Dev Technol. 14 (5): 298-307.